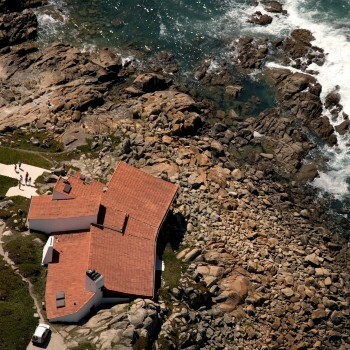 Nestled on the romantic Atlantic coastline, the Boa Nova restaurant and teahouse is one of the architectural landmarks by Alvaro Siza just outside Porto. Now re-opened after restoration it is a must-see place if touring anywhere near Porto this summer. The diversity and abundance of materials used in Boa Nova reveal an almost obsessive exploration of the interplay between volume and substance, a far cry from the stark relationship of copper, concrete and black painter wood of the oceanic pool. However, the essential qualities of both projects are similar. In Boa Nova, as well as in the Leça pools, Siza delivers a clear account of the architect’s role in the delicate dialogue between the artificial and the natural.